Home | Llandwrog Tourist Information and pictures of Llandwrog, Gwynedd, Wales. Llandwrog is a village in Gwynedd, north-west Wales. The village has developed around the fine Victorian edifice of Saint Twrog's church, and the village, although small, is particularly attractive with Picturesque stone-built cottages under slate roofs clustered around the place of worship. Much of the village was built during the 19th Century by Lord Newborough as part of his plans for Llandwrog as a model estate village, and included Alm's Houses, Church and cottages. Close by stands the Dinas Dinlle Iron Age Hillfort, an ancient fortification of about 20 acres. Believed to be a British settlement, finds of Roman pottery indicate reoccupation in the 2nd or 3rd centuries. The hillfort is a roughly oval defended enclosure, set on the summit of a drumlin. Within the eastern part of the interior are traces of circular or rectangular structures or enclosures, one being a possible sepulchral mound or alternatively a Roman pharos or lighthouse. RAF Llandwrog was a training airfield during World War II, and was later used as a weapons storage facility. It had a key role in Operation Sandcastle, where a large quantity of Nazi Tabun weapons was stored prior to eventual disposal at sea. St Twrog's Church is a Victorian church in a Decorated Gothic style, built in 1856-60 of Anglesey limestone lined with Bath stone, it has a tower and spire 110 feet high. The church is built on the footprint of the medieval parish church. The church comprises a nave, transepts, chancel, south chancel chapel and north vestry; the south-west tower has a tall broach spire. It has a Victorian octagonal stone pulpit with traceried panels and tapered shaft, the south housing the lectern, and an old wooden pulpit incorporating a fine early 16th century panel, probably of Flemish origin, depicting the Crucifixion. In the shade of the tower is the gravestone of Ellis Wyn o Wyrfai, poet, writer and clergyman 1827 - 1895. Llandwrog is also home to a Presbyterian Chapel. Bwlan Presbyterian Church of Wales holds services every Sunday - morning or evening, the time varies. They are a welcoming lot and during the Christmas service they have contributions from several of the members and children. They have a lively, flourishing Sunday school. 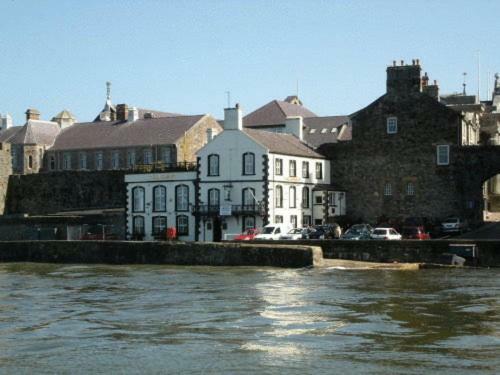 The Harp Hotel, a fine stone building standing adjacent to the church, offers good food and drink. Close by is the popular Dinas Dinlle Beach. It is a large sand and pebble beach, the pebbles alone being visible at high tide - the vast areas of sand becoming visible at low tide level. 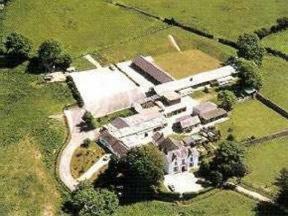 You may make an instant secure hotel or cottage reservation close to Llandwrog. Hotel and cottage availability and letting rates are confirmed online prior to booking. Simply click through to the accommodation page, choose a suitable property, check availability, including dates of stay, to confirm the exact room rate and reserve the accommodation.